Duel Links Ojama Deck, How to Use, Ojama Deck Skill. Quite simple deck to use, Fusion summon Ojama fusion monster to use as beatsticks while locking down your opponent's unused monster zones. Having Ojama Country on the field is crucial to your beatdown strategy, so using Land of the Ojamas as your skill is very helpful. Ojamatch is a strange card that connect 2 completely unrelated archetypes. It uses Ojama monsters as fuel to search an Armed Dragon or another Ojama monster and you can choose to immediately summon it to your field. This effect can also be used during your opponent's turn, which makes the best timing to activate this card during your opponent's end phase. Search and summon Armed Dragon LV3 during your opponent's end phase, or during your draw phase if you set self chain to "on", and then upgrade him into Armed Dragon LV5 during your standby phase. If you have Armed Dragon LV7 on the field you can use Ojamatch to search out Armed Dragon LV10 from your deck. This is because unlike other LV monsters Armed Dragon LV7 does not directly upgrade into Armed Dragon LV10 and you need to draw into Armed Dragon LV10 to upgrade him manually. Searching with Ojamatch eases this condition. Ojama monsters are really weak on their own, but with Ojamatch you can make use of them as fuel essentially turning an Ojama in your hand into at least an Armed Dragon LV5 on your field. 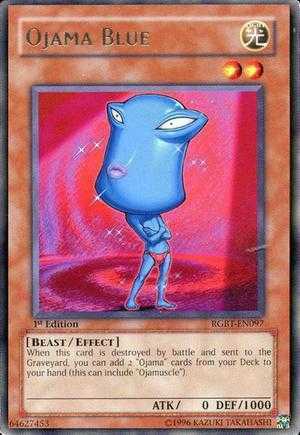 Ojama Blue is used to gain resources by having him destroyed and searching out 2 Ojama cards from your deck. You can search out another copy of Ojama Blue with his effect to later search out 2 more cards. You can also Search Ojamatch along with an Ojama monster to fulfill Ojamatch's activation condition and summon an Armed Dragon to your field. Ojamas also have their field spell which would be played at the start of the duel because of your skill. Ojama Country switches the attack and defense of all monsters on the field as long as you control an Ojama monster. This could be used as an unusual way of dealing with your opponent's monsters. if ever they have large attack stats but weak defense. But be careful because this stat switch also affects your monsters and Armed Dragons have poor defense stats. Armed Dragons are formidable in terms of offense. All of them except for Armed Dragon LV3 have decent attack stats and a destruction effect that gets rids of your opponent's monsters. The power of their destruction effects increases per form with Armed Dragon LV5 as single target, Armed Dragon LV7 and Armed Dragon LV10 being able to wipe your opponent's monster zone. They are special summoned through the effects of their previous forms (except Armed Dragon LV10) so can be kickstarted by Ojamatch summoning Armed Dragon LV3, you can also use Ojamatch to search out Armed Dragon LV10 because he needs to be upgraded from your hand. One thing you need to look out for is to make sure you do not control an Ojama monster while an Armed Dragon is on the field because Ojama Country will switch their attack and defense stats. Level Up! 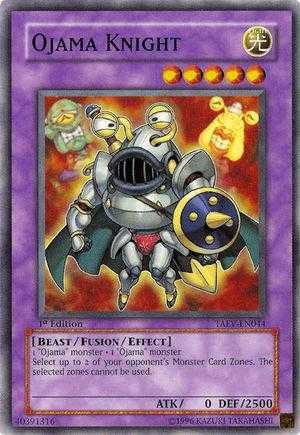 is an excellent support card for any LV monster. It sends a LV monster to the graveyard and special summons it's upgraded from from your deck. Summon Armed Dragon LV3 during your opponent's end phase with Ojamatch, then upgrading into Armed Dragon LV5 during your standby phase, finally during your main phase follow up by using Level Up! to special summon Armed Dragon LV7. Although you cannot go from Armed Dragon LV7 to Armed Dragon LV10 with Level Up! because Armed Dragon LV10 is not stated in Armed Dragon LV7's effect. Ojama Country is a key card in this deck, without it active you have no chance of winning. While Ojama Country is on the field and you control an Ojama monster, the attack and defense of all monsters are switched turning you to use 0 attack Ojama fusion monsters into 2500+ attack beaters. This also harms decks with low defense monsters such as Nephthys and Beast Rising decks. Finally, card also allows you to revive any Ojama monster in your graveyard, even the fusion monsters. Set Ojama Blue then allow your opponent to destroy him by battle to search 2 more Ojama monsters from your deck. Enchanting Fitting Room excavates the top 4 cards of your deck and special summons all level 3 or lower normal monster to your field. 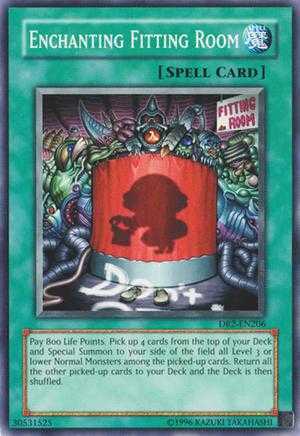 Great for Ojama decks, since most of your deck monsters are Level 2 normal monsters. Heart of the Underdog allows you to continuously draw as long if you draw a normal monster. This could help you regain the cost of fusion summoning. 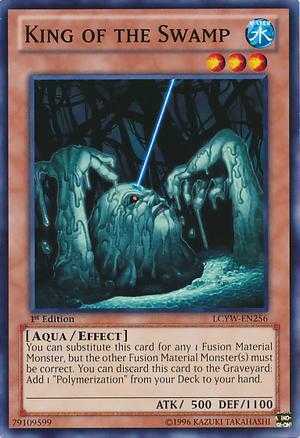 King of the Swamp can be used to search your deck for Polymerization, or he can be used to substitute for a fusion material. Fusion Sage searches Polymerization in your deck. 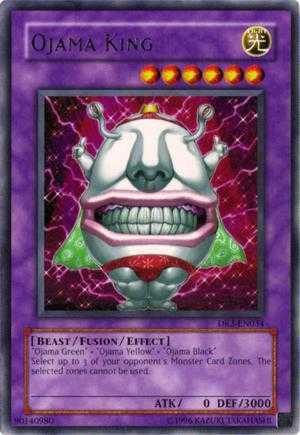 The goal of this deck is to special summon as many of these monster as you can, while Ojama Country is active, to use as beatsticks and to lock your opponent's field. While all monsters on the field have their attack and defense switched, almost nothing can overpower Ojama King and Ojama Knight. The Dark - Hex-Sealed Fusion Substitutes for a fusion material and allows you to fusion summon without polymerization. Giant Soldier of Stone 2000 attack with Ojama Country, and can be special summoned by Enchanting Fitting Room. 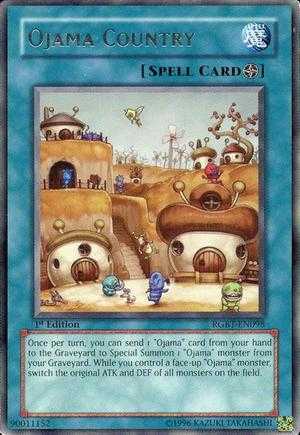 Symbols of Duty Tribute a Normal Ojama monster to revive a monster in either player's gravyard to your side of the the field. Shield &amp; Sword Temporary Ojama Country. Fusion Weapon Can be used on your Ojama fusion monsters, significantly boosting attack. 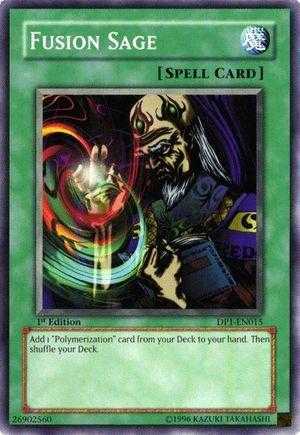 Ojamassimilation Use this card in a build mixed with AtoZ monsters. Allow you to swarm your field and immediately get XYZ-Dragon Cannon out with enough Ojama monsters in your graveyard. Hardly anyone runs Soul Exchange or Tribute to the Doomed these days. Monster removal is performed via monster effects nowadays. So, if you do manage to summon Ojama King on the first turn, you will win 99,9% of the time. You do realize that Forbidden Chalice is pretty popular? I just want Ojama Blue! 10 Hurricanes, 8 Despair, 11 Lvl 5, 4 Kings, 0 Blues. I feel you man. So which level are you farming this at? Chazz Lvl 10,20 or 30? how to get more Ojamassimilation ? 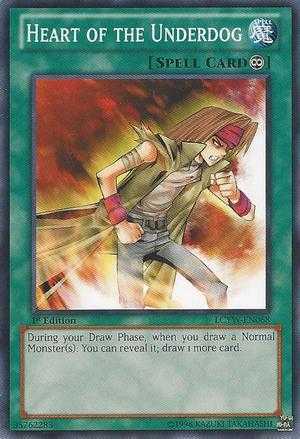 Only if you use is with the Pegasus Extra, Extra you can draw 2. Spend around 1K keys. Ojama Blue was very difficult to get. Maybe I will not spend keys anymore on something uncertain like that. 2 cards are enought. It's better to take on reward card, if this deck is strong enough. But this is a cool deck. Isn't The Dark - Hex-Sealed Fusion completely useless here, shouldn't it be The Light - Hex-Sealed Fusion?